Posts tagged "The Exit Light Company"
The Exit Light Company is pleased to announce that the new Product Catalog is available online at our website for immediate download. This beautiful full-color 32 page catalog provides details for just some of the hundreds of exit signs, emergency lights, exit lights (exit sign/emergency light combos), and accessories that we carry. (We just couldn’t fit everything in!) Be sure to visit www.exitlightco.com for pricing, and to see an even larger selection of products. We take great pride in our industry leading pricing and service. For nearly a decade, 95% of our orders have shipped the same day from our own warehouse stock. 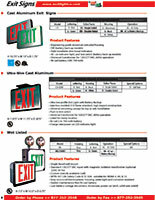 Download the 2012 Exit Light Company Product Catalog (3.1 MB) today. As one of the first online retailers of Exit Signs and Emergency Lighting, we have heard just about every question there is about emergency lighting products. As the ONLY internet retailer who has a staff of electricians, has an electrical contractor’s license, and actually does installations, we’ve already experienced every potential problem or issue that you may be concerned about. In the future, we will be posting some of those along with general gotchas that can catch both new installers and grizzled electrical vets. Plus, look for helpful notes on some of our bestselling products.